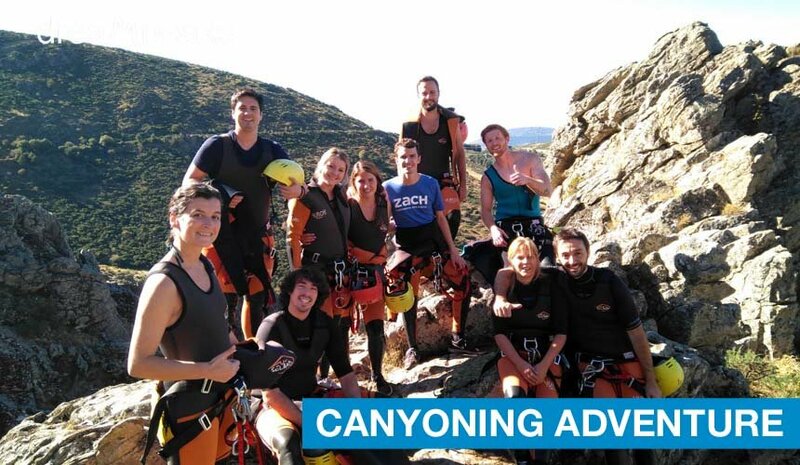 Canyoning in Madrid - Canyoning Adventure Madrid. Water Sports Madrid. Enjoy a Canyoning Adventure Tour in Madrid. You will descend through waterfalls, pools, vertical rappels/abseils through 30 meters granite walls and a fun slide of 9 meters. 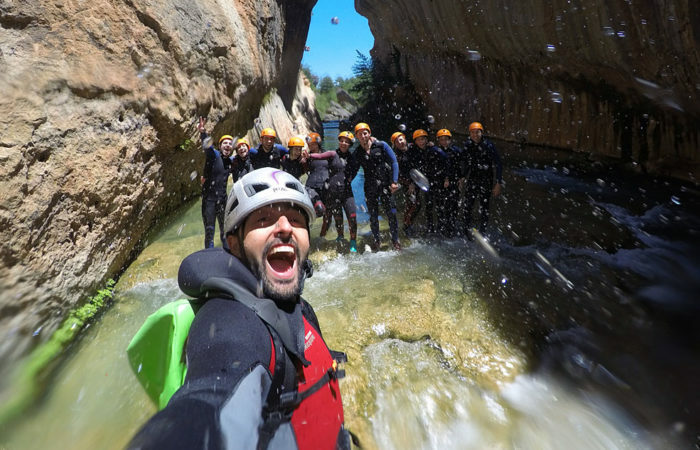 Canyoning in Madrid is a fun water adventure just 1 hour from Madrid city. Transport Included. 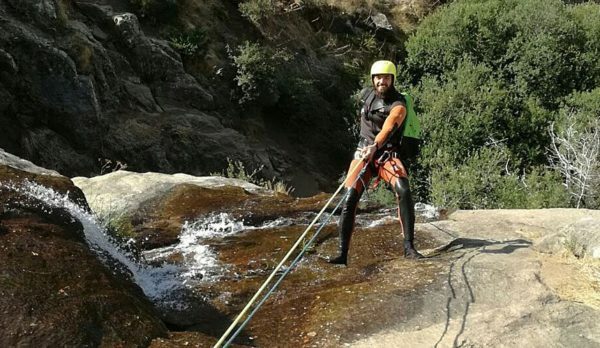 Canyoning (“canyoneering” in USA or “barranquismo” in Spanish) is the activity of going through canyons using a variety of techniques including walking, scrambling, jumping, abseiling (rappelling), and swimming. The Canyoning tour of Somosierra is the only open canyon of the Community of Madrid and offers the opportunity to live a fun aquatic adventure in the impressive scenery of the river Duratón gorges. After a 30 minute walk from the car, we will reach the top of the canyon. The canyoning descent includes waterfalls, pools, vertical rappels/abseils through 30 meters granite walls and a fun slide of 9 meters. This activity is suitable for adventureous people and is led by professionals guides so that participants can safely enjoy one of the most exciting water sports in Madrid. 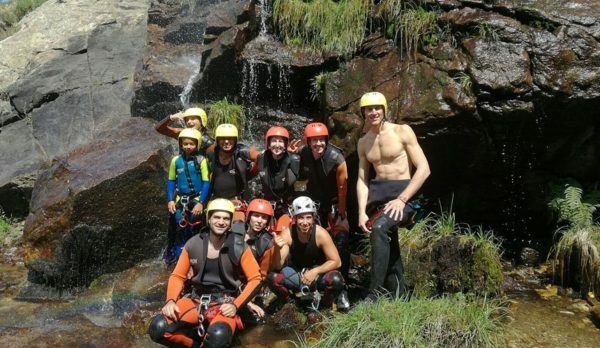 Certified Canyoning Guide (english speaking). Canyoning in Madrid Tour of Somosierra (3 hours approximately). Group Safety equipment and gear: ropes, abseil devices, carabiners, waterproof case and first aid kit. Accident and Liability Insurance cover. Optional Canyoning Boots rental 8€. -This tour involves sections through mountain trails, river course, flowing water and wet slippery rock. -Do not suffer from vertigo. -No recommended for pregnant women. -Daypack, swimwear for under the wetsuit and towel. -Pair of sport shoes with grip sole or hiking boots to wear in the river (no tennis or flat sole shoes, no flip flops or sandals). In case you don´t have hiking boots or sport shoes with good grip sole, we recommend you to rent our available hiking boots for 8€. -Dry casual/sport wear and shoes/flip flops to change after the activity. -Water and light snacks/energy bars. -Don´t bring rings or non waterproof watches. It was an awesome activity. Gabriel was very good in responding to my inquiries and also was on time for the pick up. He had great customer service. Our guide was very patient and helpful and knowledgeable. I highly recommend Dreampeaks. Sirach (USA). Dreampeaks – Tripadvisor. 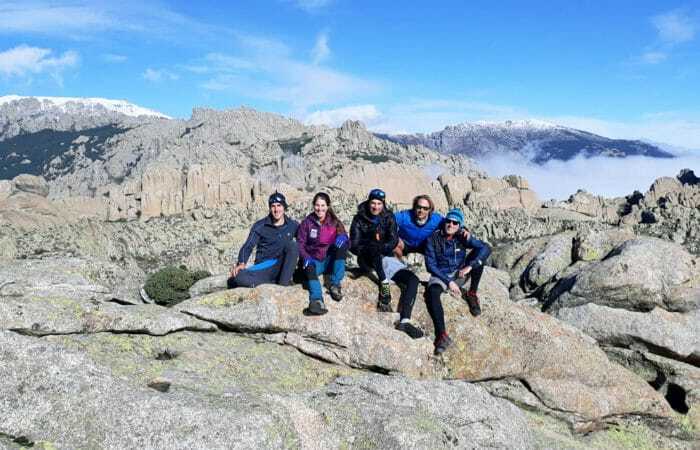 We went canyoning with dream peaks while on a 5 day 50th celebration in Madrid. We met Sergio who took us up the mountain, were given wet suits and helmets and after a short climb we began the descent down the cliff face. Sergio’s English was really good and the instruction was easy to understand. Nothing overly strenuous so it’s easily an activity for most ability levels. We thoroughly enjoyed it. We can not thank Sergio enough, a really pleasant chap and expert in his field. A refreshing cool down from the heat of the city. Big thanks to Gabriel Sergio and the team! Carlo (UK). Dreampeaks – Tripadvisor. 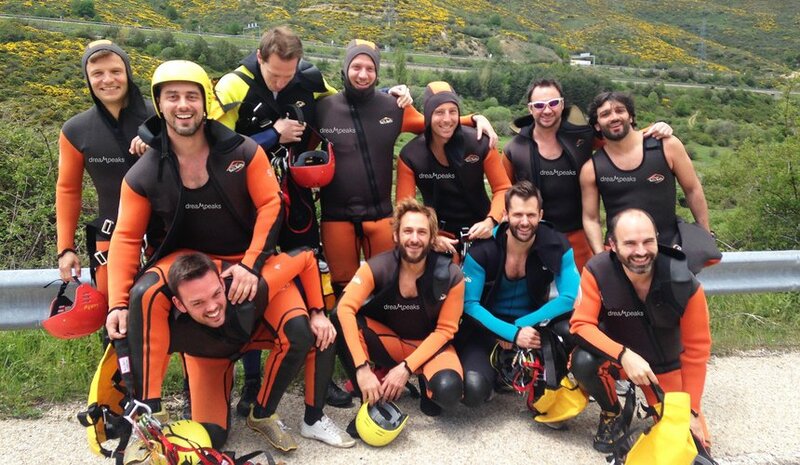 We went canyoning with dreampeaks while on a weekend stag do in Madrid. I shared a few emails with Gabriel beforehand who told us exactly what to bring, where to wait for pick up and the stag went for free. We got picked up really close to our hotel which was great because we didn’t know the area at all! The 40-50min drive gave us a chance for a quick nap as we hadn’t really slept the night before. When we got there and met Sergio who took us up the mountain, we were given wet suits and helmets and after a short climb we began the descent down the cliff face. It’s a bit slippy so trainers are definitely recommended but the water is refreshing when it’s hot so don’t worry about overheating in the wetsuit! Sergio’s English was really good and the instruction was easy to understand. Nothing overly strenuous so it’s easily an activity for most ability levels. We thoroughly enjoyed it and while it’s best to leave your phone and cameras in the van we were sent loads of pictures of the experience afterwards. Big thanks to Gabriel and the team! 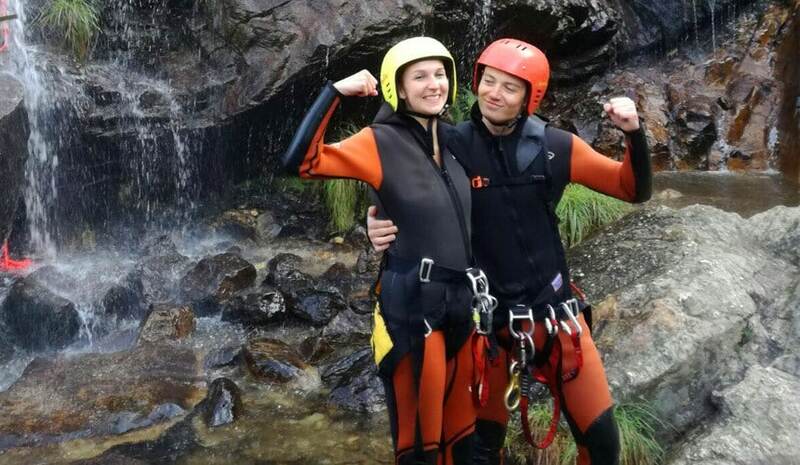 We went “canyoning” with dreampeaks and had an awesome time. The service was outstanding, the guide was friendly and committed to our safety and we had a blast. Kenny Ellis (USA). Dreampeaks – Tripadvisor. This was our first time trying canyoning and it was fantastic! Our guide was Sergio and he did a great job teaching us what to do. When planning the trip, Gabriel was very quick to respond to emails and answer all of our questions. Since a group tour was not available on the day we wanted, he organized a private tour. He even arranged for our guide to pick us up from our hotel in Madrid. The whole experience was great and I would highly recommend it! Karen (USA). Dreampeaks – Tripadvisor.